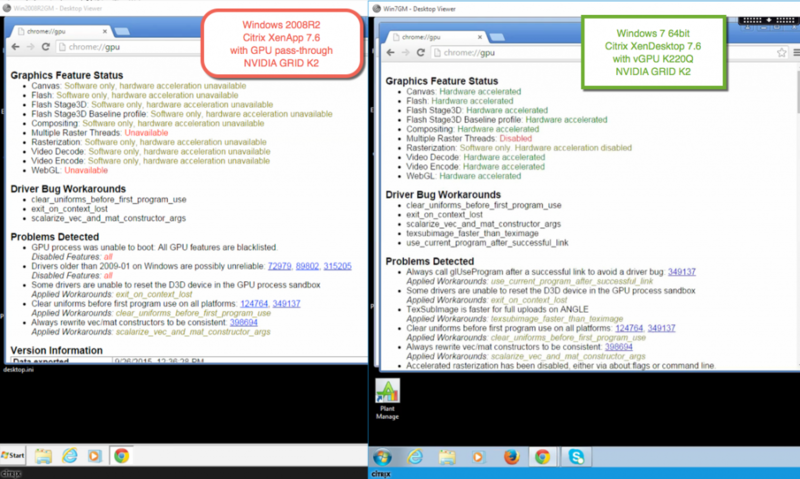 Google Chrome v. 45 have changed their behaviour of their web browser, so they are blacklisting GPUs, which means hardware acceleration is disabled by default in a Remote session this behaviour is seen in Microsoft RDS with RemoteFX, Citrix XenApp 6.5 -> 7.6 with vGPU/GPU pass-through. Behaviour is also seen on Linux environments with Google Chrome. 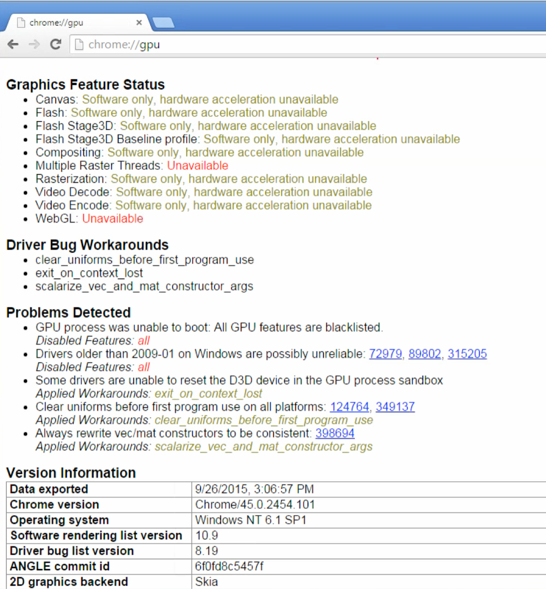 Open Google Chrome and type in chrome://gpu and then you will see if your RDS/XenApp with a GPU is working or not. 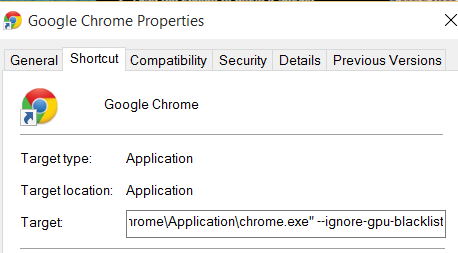 With Google Chrome v 45 the default behaviour is now that Google choose to disabling the GPU. 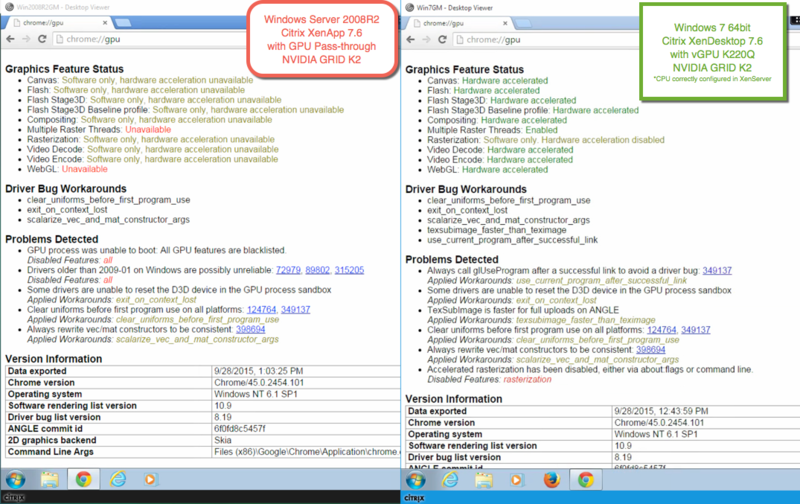 interesting is that Multiple Raster Threads in Win7 with a GPU is disable… why lets find out. This is properly because you haven’t configured the CPU correctly in the hypervisor for the virtual machine. * hint I did on purpose so you can understand it can be complex to troubleshoot if you don’t configure your environment correctly. Then Multiple Raster Threads works in Win7 after you changed the configuration of the CPU on the Win7 vm. Now we have validated that the GPU is blacklisted in RDS/XA with a GPU, lets see if we can fix this. 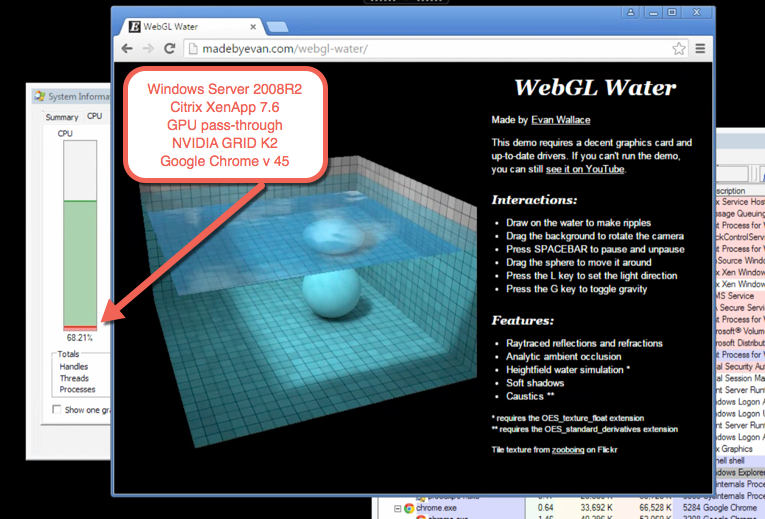 CPU is very high when the Google Chrome is running the WebGL application. This is because its using the CPU to do software rasterize of the GPU and this makes your user able to run a webgl application without a GPU, but wait. We actually have a GPU in our RDS/XA server now, why is this not offloading the CPU, thats because Google desided to turn off GPU and blacklist them. 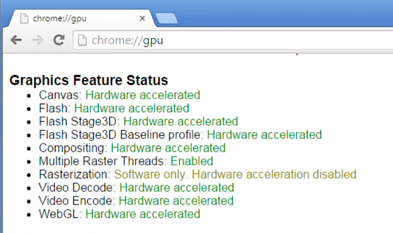 GPU hardware acceleration is now working in RDS/XA with a GPU in Google Chrome and CPU is now offloaded to the GPU as you can see in the below picture. 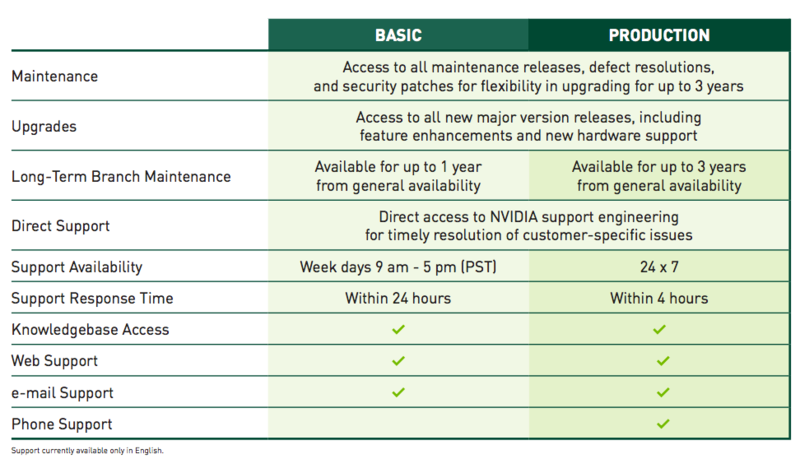 NVIDIA have released the next generation of GRID 2.0. GRID 2.0 is based on the Maxwell architecture and the GRID 1.0 (K1/K2) was based on the Kepler architecture. I have been working with the GRID 1.0 technology since 2012 and it have matured alot in its 2 years of history. 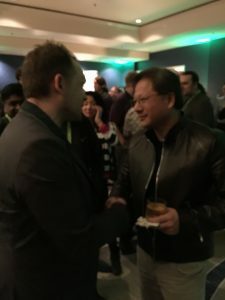 When the K1/K2 was released they was first working with GPU pass-through and then vGPU got introduced and you could virtualize the GPUs and increase density, which people wanted. 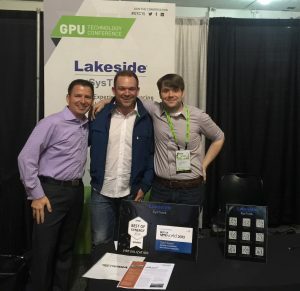 Citrix was with their hypervisor the first company that supported NVIDIA GRID 1.0 and they was also the first company integrating vGPU into their Citrix Studio, so companies could easier provisioning machines with either MCS technology or PVS technology. 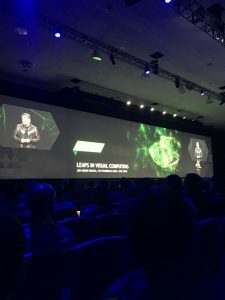 VMware supported GRID 1.0 vGPU technology in 2015 in their hypervisor VMware vSphere 6.0 and fully integrated with their EUC stack VMware View, so companies can fully provisioning machines. The great thing about GRID 2.0 is that there is no need for a conversation when to choose either a K1 or a K2, if you required GPU compute or GPU framebuffer, M60 are being added to the tope end of the range and bringing 2x the performance, and if you have bladeserver’s, you can add the powerfull vGPU technology into the bladeserver’s with the M6. 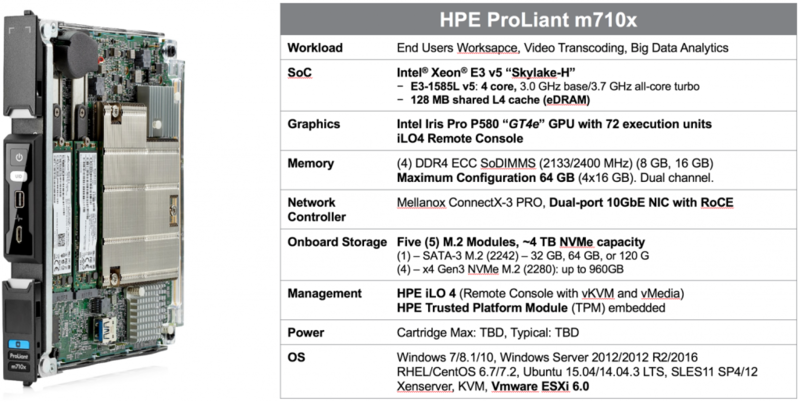 Please notice that M6 will 0nly be supporting newer architecture of vendors not old platforms. The M60 has 6x the h.264 encoders of the K2, and also Maxwell supports 4:4:4 chroma sub sampling, which is great news for encoders. 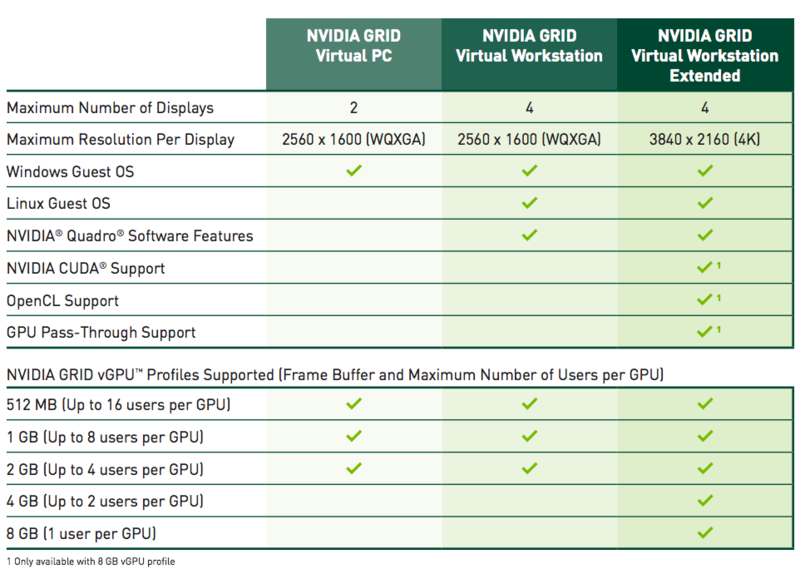 NVIDIA GRID 2.0 software is available in three editions that deliver accelerated virtual desktops to support the needs of your users. These editions include Virtual PC, Virtual Workstation, and Virtual Workstation Extended. GRID perpetual licenses are sold by Concurrent User (CCU). NVIDIA GRID 2.0 software is much more than a “driver”. While the software package does include a guest driver for Windows and Linux, it also includes the NVIDIA GRID vGPU manager for VMware vSphere and Citrix XenServer, as well as the license server and M6/M60 mode switching utility. 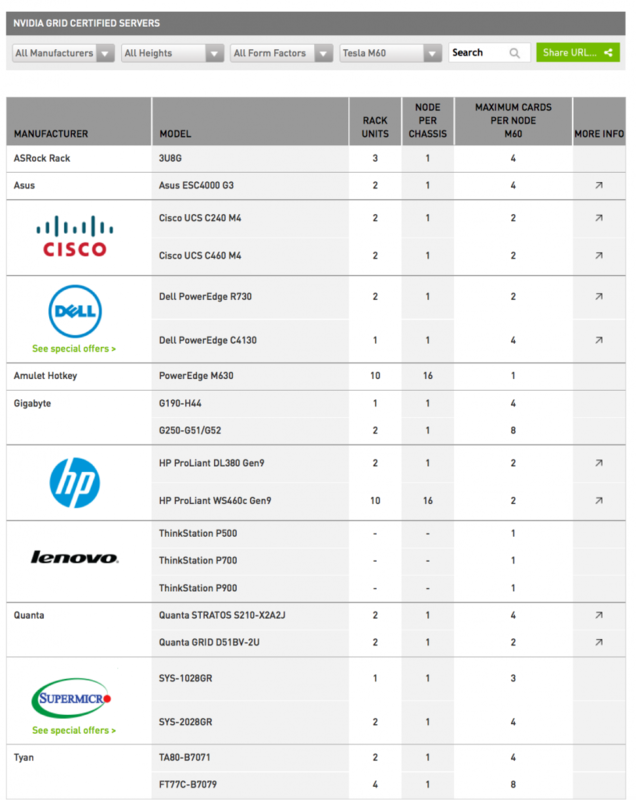 NVIDIA Tesla M6 and M60 profiles are specific to the M6 and M60. 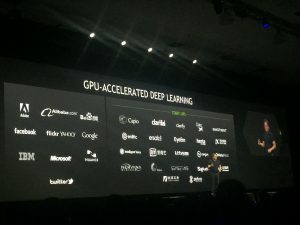 There will be similar profiles as to what NVIDIA had on K1 and K2 (512 MB through 4 GB), all with twice the number of users on M6/ M60 compared to K1/K2. Plus, there is an additional 8 GB profile on M6/M60 which also adds support for CUDA, which wasn’t available on K1/K2. 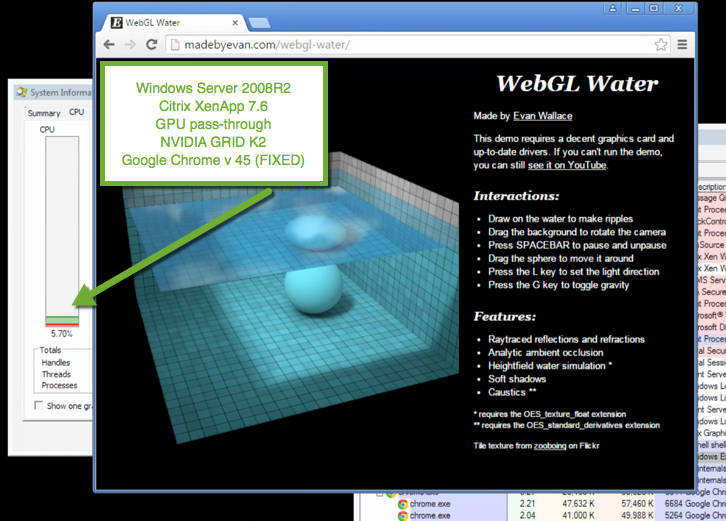 NVIDIA GRID 2.0 is Maxwell only. If you are an existing customer K1/K2 are unchanged and will remain as a parallel option. GA of NVIDIA GRID 2.0 (M60 and M6) will be 15 September 2015. 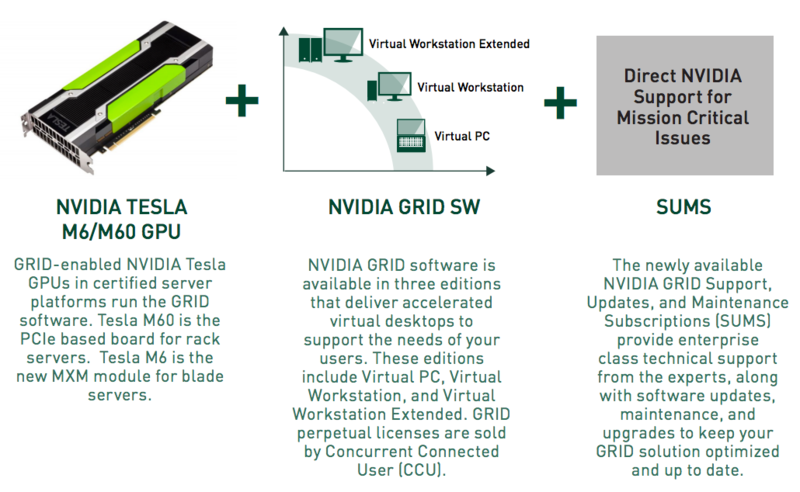 NVIDIA have released a new GRID Virtual GPU Manager 346.68 for Citrix XenServer 6.5 and VMware vSphere 6. If you have GRID Virtual GPU Manager 346.68 installed in either XenServer or VMware you only need to update your VMs. 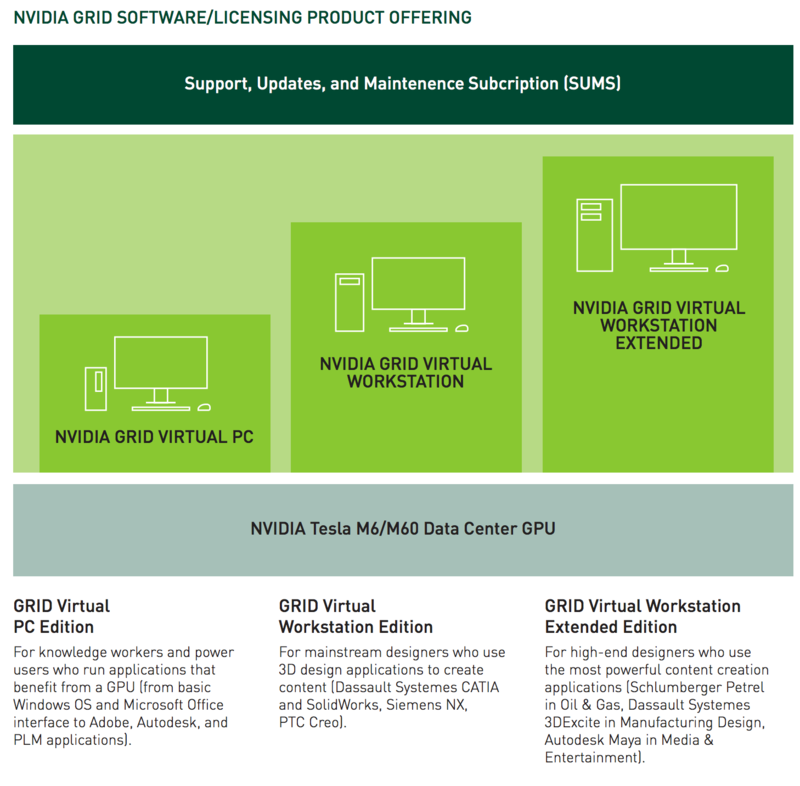 The GRID vGPU Manager and Windows guest VM drivers must be installed together. 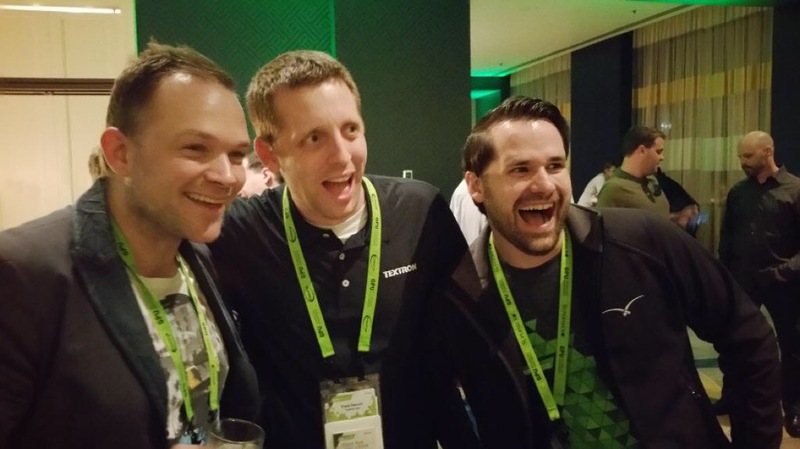 Older VM drivers will not function correctly with this release of GRID vGPU Manager. Similarly, older GRID vGPU Managers will not function correctly with this release of Windows guest drivers. 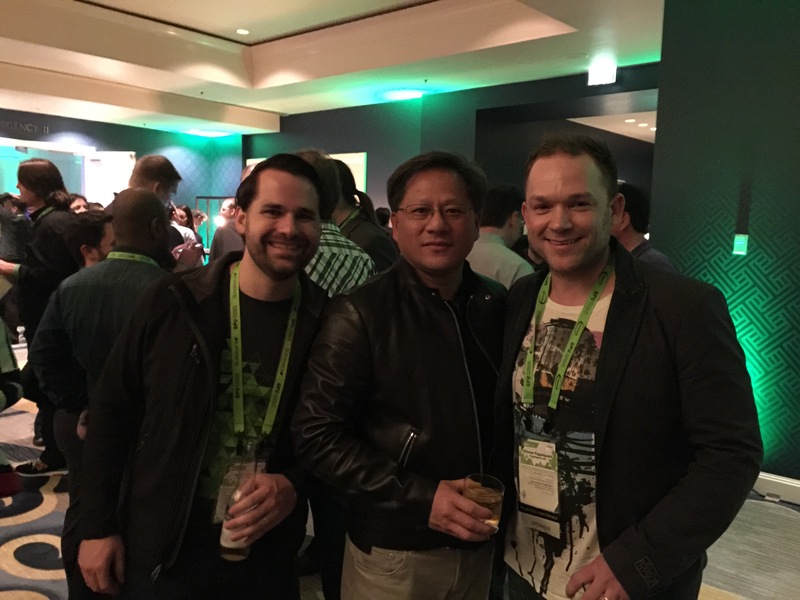 After a succesfull NVIDIA GTC (gpu technology conference) in San Jose, March 2015. 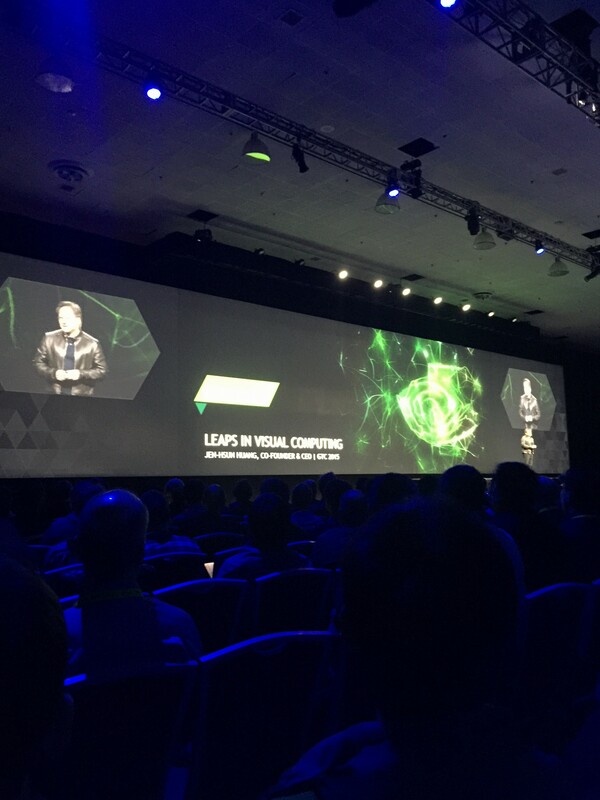 It was amazing all the brain gathered in one place, at NVIDIA GTC 2015, I had so many great conversations with friends, partners and there was one sentence I thought through “try to imagine what could you do for the world if we tried to build 1 thing with all this brain power in joined forces” . 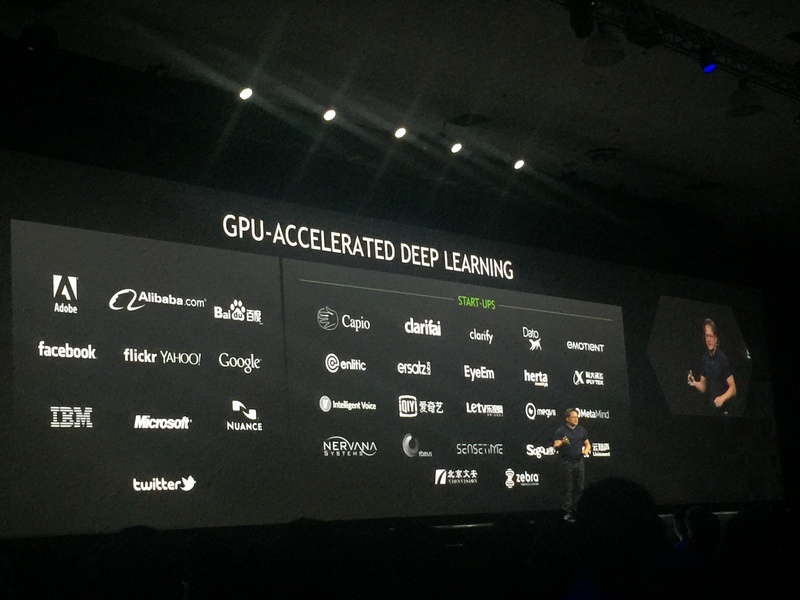 NVIDIA is doing amazing things and this year it was all about “Deep Learning” and “NVIDIA GRID”. 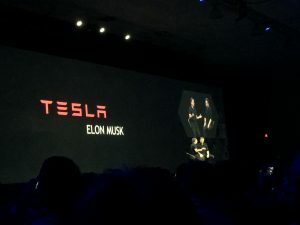 Google was part of the keynote and it was very interesting seeing how far AI is evolving, Elon Musk the guy behind Tesla, Space-X was also on stage. Great meeting Lakeside Software and seeing they had the “print” of the case study I did with Magnar Johnsen we did for Firstpoint client AIBEL. 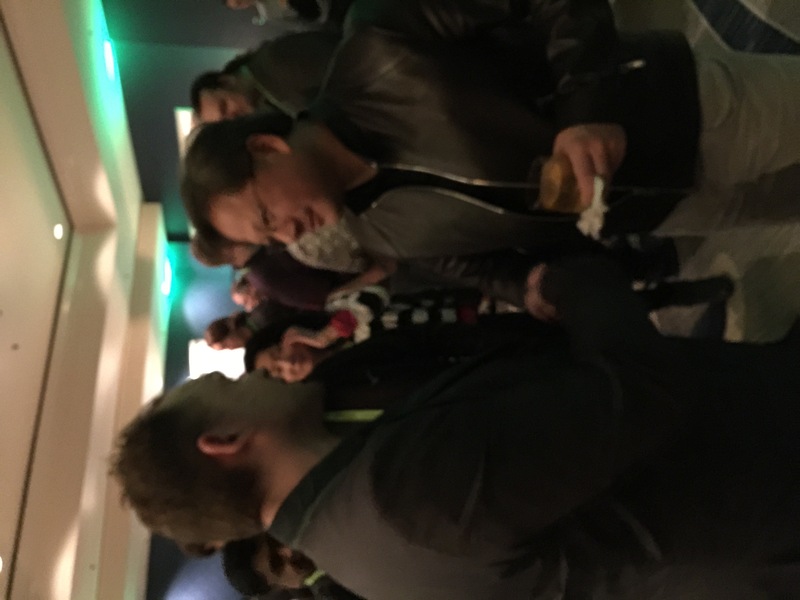 I meet for the first time the CEO and founder of NVIDIA Jen-Hsun Huang, he is a very inspiring person. Another great friend was Fred Devoir from Textron “the man in the middle” and another great friend and fellow CTP, Dane Young. 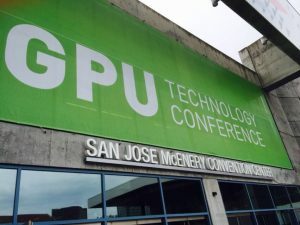 Fred Devoir had two sessions at GTC, I highly recommend you watch them both. If you attended and could see all the sessions or you couldn’t join GTC, now all 500 sessions are available for the public. 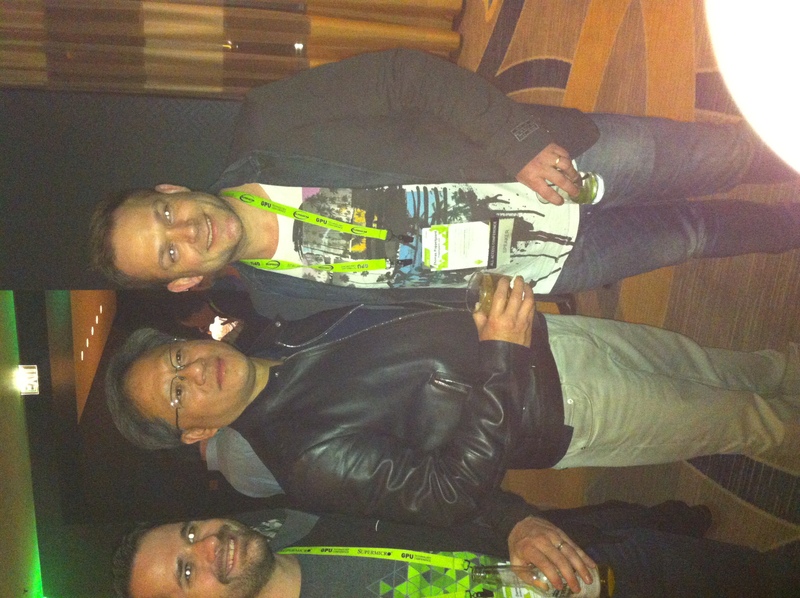 #AMAZING, thank you NVIDIA for this. Click the sessions with the “blue” link and the recorded session will start. S5872 – Worlds Collide: What Happens When VDI Meets GPU? 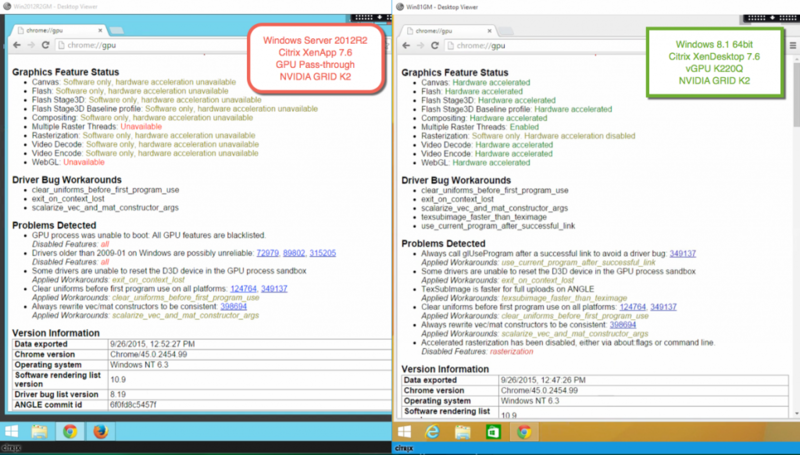 S5377 – Running SAP 3D Visual Enterprise Using Citrix and NVIDIA – What about Performance? Fred Devoir Sr. Architect, Textron Inc.
Randall Siggers Solutions Architect, Textron Inc.
Clint Pearson IT Infrastructure Systems Lead, HDR, Inc.
Jeremy Korell IT Infrastructure Systems Lead, HDR, Inc.
Clint Pearson, IT Systems Lead, HDR Inc.